From 1965 to 1972, it revolutionized ‘The Good News,’ and shook the foundations of the existing print and visual media. After seven years, it went just as it came – in a hail of livingness. In true American phantasmagoria, it was a legend in its own time. 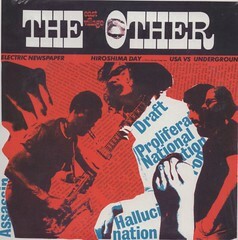 Initiated by poets, painters, artists, seers, perverts and prophets, it shared its pages with the likes of Buckminster Fuller, Timothy Leary, Robert Crumb, Ishmael Reed, Allen Ginsberg, Lenny Bruce, The Beatles, Bob Dylan, Baba Ram Das, Jerry Rubin and Abbie Hoffman – the conspiracy of the 1960s. The above was written by the late Allen Katzman, poet and co-founding editor of the East Village Other, one of the pioneering underground newspapers. Over the next six weeks, The Local will journey back to the East Village of the mid-1960s and early 1970s with special weekend editions, culminating in an exhibit and party on Tuesday, Feb. 28. We hope you’ll join us for “Blowing Minds: The East Village Other, the Rise of Underground Comix and the Alternative Press, 1965-72.” Full registration details for this free event are at EastVillageOther.org, where you’ll soon also be able to find archival material, ephemera, photographs, and EVO issues. The panel on Feb. 28, to be livecast on this site, is poised to feature some of the EVO’s greatest living treasures: Ed Sanders, Steven Heller, Claudia Dreifus, Dan Rattiner and two who still live in the neighborhood – EVO editor Peter Leggieri and writer and activist Alex Gross. Other neighborhood residents, illustrator and cartoonist Yossarian and writer Steve Kraus, have helped us locate and gather the far-flung EVO tribe. John McMillian, author of “Smoking Typewriters: The Sixties Underground Press and the Rise of Alternative Media in America,” will moderate. 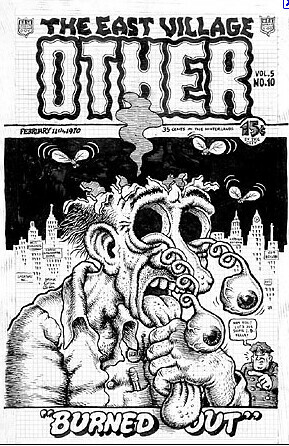 “Blowing Minds” is co-sponsored by N.Y.U.’s Program in Museum Studies, and Fales Library and Special Collections at Bobst Library, which just acquired, for its renowned Downtown Collection, Peter Leggeri’s nearly full pristine run of EVOs and of its eight-issue comix paper, Gothic Blimp Works. Support for the exhibition has come from the New York Council for the Humanities, the N.Y.U. Humanities Initiative, the John S. and James L. Knight Foundation, and one of the EVO’s greatest (now uptown) fans, Alan Abramson. EastVillageOther.org will also feature newly commissioned and republished pieces about the period from legendary EVO writers, artists (we’ve solicited a piece from R. Crumb), and thoughtful fans. If you’d like to contribute, please e-mail the editor of The Local. We’re seeking posts of 600 to 1,000 words. Hope you’ll mark your calendars for Feb. 28, 6:30 p.m. at 20 Cooper Square. This should be some party.